Lake Mburo National Park habours several species not observed elsewhere in Uganda. 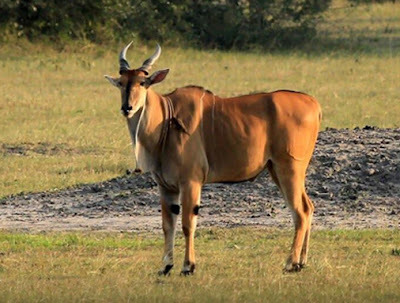 It is the only place in Uganda to support a population of impala (from which Kampala city derives its name), and only one of the three protected areas countrywide where Burchell’s zebra occurs, the other two being the far less accessible Kidepo and Pian-Upe. Other antelopes easily seen are topi, bushbuck, common duiker, oribi, Defassa waterbuck and Bofor reedbuck, while the lake and lush fringing vegetaion support healthy populations of buffalo, warthog, bush-pig and hippopotamus. Large herds of the majestic eland keep roaming the park. The sitatunga confines itself to the swampy areas of the park. Only two diurnal primates occur in Lake Mburo: the vervet monkey and olive baboon. Nocturnal calls of the spotted hyena can be heard through the night. Leopard, side-striped jackal and various smaller predators are also present, most visibly the white-tailed mongoose and three otter species resident in the lakes. Day 1: Leave Kampala from your place of stay at 6 am. Drive to Lake Mburo, water provided by us along the way. Check into Park and go on a Drive of the Park viewing the animals and along the 3 hour drive with Uganda Wildlife Authority Guide. Fabulous views of Buffaloes, Zebras, Leopards, a variety of antelopes, warthogs, and one of the few places to view zebras in Uganda. Lunch (not included on tour cost please) along the Lake (there are 5 lakes within the Park) and then a boat ride along the shore. View crocodiles and lots of hippos with a variety of birds to see. This is the highlight of your trip there today. Afterwards, we bid farewell to the park’s friendly staff as we depart for Kampala. We drive through a magnificent hilly country and lush cultivation on an approximately four-hour journey. En route we will stop at the Equator for photographs and ‘polar-water experiment’, then a local community popular for making local drums (Mpabire Village), gardens, crafts shops and fruit markets.